There are a lot of very useful concepts which are nowhere near as widely known as they should be. One of these is the concept of instrumental versus expressive behaviour. It makes sense of a broad range of human behaviour which would otherwise look baffling. It explains a lot of the things that politicians do, and a lot of the ways that people act in stressful situations, for instance. This article gives a short overview of the traditional version of the concept, and describes how a richer form of knowledge representation can make the concept even more useful. The concept of instrumental versus expressive behaviour (also known as communicative behaviour) has been part of sociology and social psychology for a long time, and tends to be taken for granted in those and related fields. Instrumental behaviour is about getting something done. For instance, eating a meal because you’re hungry is instrumental behaviour. Expressive behaviour is about sending out social signals. For instance, a politician eating a meal with supporters despite not being hungry is sending out a social signal, showing their allegiance with those supporters. So far, so good. However, a lot of things can, and do, go wrong when these concepts play out in the world. One example is bedside manner in the medical world. The medical staff are, understandably, primarily focused on instrumental behaviour that will keep the patient alive and help the patient recover. However, this can often come across to the patient as a significant absence of expressive behaviour; the patient therefore perceives the medical staff as uncaring. Another example is politicians engaging in expressive behaviour that is apparently useless in practical terms, such as voting for a particular policy that has no chance of ever being enacted, to send out a signal to their supporters. This overlaps strongly with the concept of sub-system optimisation not necessarily leading to system optimisation; what’s good for one politician, or for one political party, may be disastrous for the country or the world as a whole. If you deal with people at times of stress, such as students around exam time, you see another crossover between instrumental and expressive behaviour. When people can’t solve a problem via instrumental behaviour, they often try using communicative behaviour instead, to signal that they care about the issue and are trying hard. This can easily be misconstrued, and perceived as a sign of incompetent cluelessness, because they’re not doing the practical things that would solve the problem. That’s a swift overview of instrumental behaviour, expressive behaviour, and how they can make sense of much apparently irrational behaviour. It’s a useful distinction, but it has problems. For instance, if a politician is deliberately engaging in an expressive behaviour in order to achieve the practical goal of being voted into power, does that mean that the expressive behaviour is itself instrumental? The answer is yes, this behaviour is both expressive and instrumental. This doesn’t need to be a contradiction. One simple way of showing these concepts in a more powerful way is to treat them as two axes on a graph, where a given behaviour can range from low to high in how expressive it is, and from low to high in how instrumental it is. It’s the same formalism that we’ve used previously for various other topics, such as false dichotomies in education theory, handedness, and gender theory. This simple transformation gives another dimension to an already powerful concept. This raises the question of just how many other useful concepts could be made even more powerful by using a richer representation. We don’t know the answer yet, but we’re working on it; it looks like being a big number…. 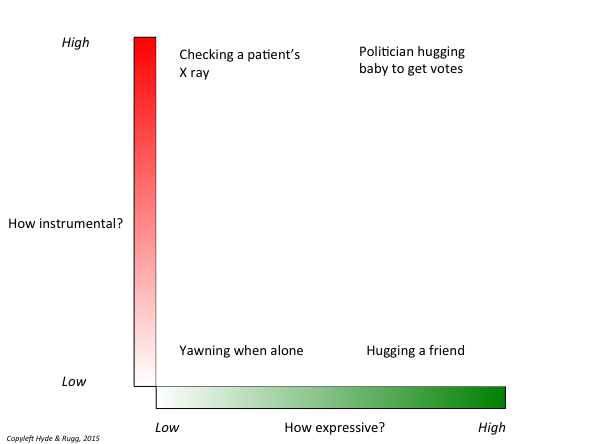 This entry was posted in categorisation, metalanguage, politics, rationalisation, system theory, useful concepts, visualisation and tagged bedside manner, political behaviour by hydeandrugg. Bookmark the permalink.